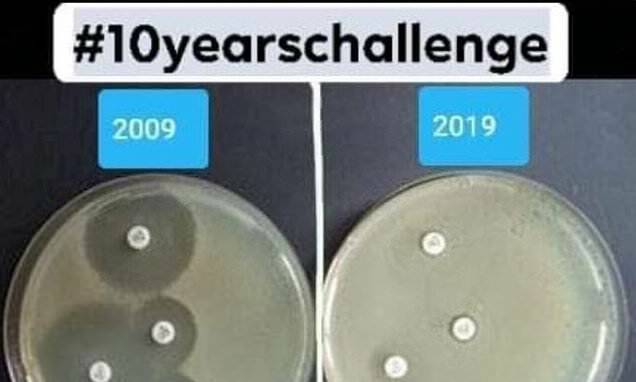 Compared to their 2009 10-year challenge photo, antibiotics don't look so good too good. Several doctors are trying to harness the power of the #10YearChallenge trend on social media to draw attention to the growing, worldwide public health crisis of antibiotic resistance. They are re-tweeting side-by-side photos of what appear to be petri dishes full of bacteria with antibiotics sitting in them - one from 2009 and one from 2019. 'This is genius and incredibly depressing at the same time,' tweeted Dr Kate Flavin, an internist in the UK. Although there is no way to know for sure what exactly is in the dishes, an antibiotic resistance expert told Daily Mail Online they demonstrate exactly he would expect to see in such a test of antibiotics against bacteria that become resistant. In the first, you can see clearings in the greenish culture surrounding each sample of the drugs. But in the 2019 photo, the bacteria's density is completely unchanged - as would be an infection in your own body - by the drugs, because the germs have been so over-exposed to antibiotics that the drugs no longer work. More than two million Americans contract antibiotic resistant infections every year, according to the Centers for Disease Control and Prevention's (CDC) estimates. The CDC says that at least 23,000 people die of these infections annually, but recent reviews of death records suggest an even more grave scenario. And it's far from a nation-specific issue. The European Union sees 25,000 deaths from antibiotic resistance a year, 38,000 people succumb to these infections a year, and 58,000 infants died in just one year due to infections passed to them from their mothers.